Having the fanciest espresso machine is no longer the ultimate status symbol when it comes to at-home beverages. If you really want to impress your friends and house guests (unless they are wine snobs), it’s now hip to serve them up a chilled pint of the beer you proudly brewed in your own house. As any such hobby goes, it can get extremely complicated and personalized, but for the beginner, Williams-Sonoma has created an introductory kit that will let you easily home-brew a tasty IPA or a smooth Summer Wheat ale. 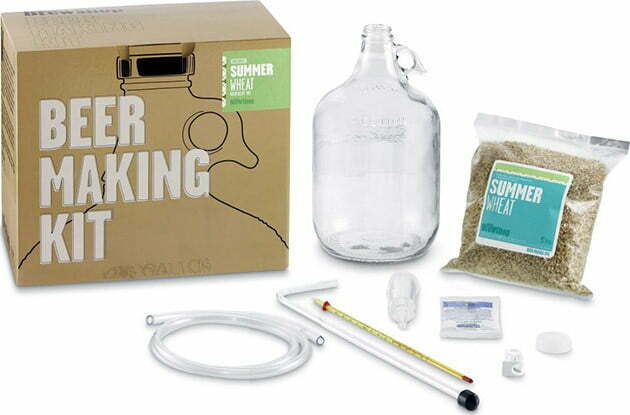 The Beer Making Kit ($40), which originally comes from the Brooklyn Brew Shop, includes just about everything you’ll need to create a delicious beer at home. Included in the kit is a one-gallon fermenting jug, a three-piece chambered airlock, four feet of tubing, and the necessary ingredients. You will need a few items of your own, like a 6-quart pot, strainer, funnel, and honey. The entire process takes about 17 days, but the equipment can be used over and over again to create fresh batches of brew. Each kit has ingredients to make a single gallon of either the IPA or Summer Wheat ale. A note of warning: this is one of those things (unlike driving directions or that Ikea bookshelf) that actually requires reading instructions. Read through them carefully and you’ll be a brew master in no time. AT&T trying to ditch the HTC Status?